Le Petit Château is a French inspired boutique hotel, pub and wedding venue nestled in the heart of the Northumberland countryside. I shot my first wedding here on New Years Eve 2016 and in the 31 days of August 2017 they were already booked for 27 of them! It's fair to say Le Petit Château has become very popular very quickly with Northumberland couples. Le Petit Château is situated on the picturesque banks of the River Rede which is well known for trout and salmon fishing. Otterburn Mill is nearby, a museum showcasing the wool milling and weaving history of the Redesdale Valley. Great Kielder Forest & Reservoir are just 10 miles from Otterburn. Formerly the Percy Arms pub, which was up for sale for over two years, it was bought by The Apartment Group, the owners of As You Like It and Newton Hall, another alternative Northumberland wedding venue, and opened in the summer of 2016. It took eight months to transform the property which is now unrecognisable. Some reports put the cost of the renovation work at over £4 million. Over 60 couples paid a deposit for their wedding here before they had even seen the finished result. The William de Percy inn and creperie combines a traditional Northumbrian pub with a continental twist, and has a warm and rustic feel, with dark furniture and exposed brickwork making for an inviting and cosy atmosphere. There are 25 luxurious bedrooms which continue the French twist; original beams are mixed with decadent chandeliers and plush sofas sport deep velvet. Le Petit Château can to cater for any size party between 30 and 160 daytime guests, and even more for an evening reception. 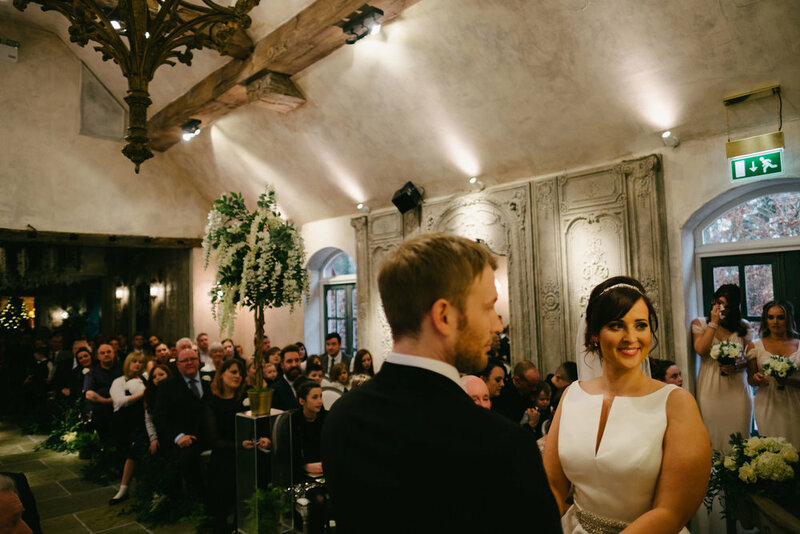 The main wedding space is the French Chapel (Belle Époque) which has a fabulous crystal chandelier, giant marble fireplace and even a storybook shingle thatched roof. The chapel opens out onto the Mediterranean terrace which has a retractable roof and outdoor fire pits. It is ideal for wedding ceremonies, wedding breakfast and drinks. The floor to ceiling windows in the Ballroom open onto the secret Mediterranean gardens complete with 16 ft. palm trees, fire on water feature and boules court. You can choose between long banqueting tables dressed with linen or traditional rustic farmhouse tables with Louis XIV chairs. The bar and dance floor are situated together to keep your party going, plus, there is plenty of comfortable seating round the corner for the oldies. There is a lot of potential variation in the types of wedding photography you can get in Le Petit Château. The chapel is very photogenic with it's marble fireplace and looks stunning once dressed with flowers. Parts of the rest of the building are quite dark so you'll need to bump up your ISO and live with a bit of grain or break out your flashes. The ballroom is a bit lighter with those floor to ceiling windows. Outside there are loads of options in the grounds, so you don't have to go far for bride and groom portraits. The gardens are lit up at night too so there is potential for dramatic night portraits. If you fancy going further afield I'd recommend going out of the front of Le Petit Château and going right over the bridge. Turn right again and there is a narrow path that runs alongside the river. Keep going for a couple of hundred yards and you arrive at a wooded area that opens out onto a small lake. This has great potential for couples portraits, especially with a nice sunset, for adventurous couples. Le Petit Château is all yours for your wedding day – no golfers, ladies that lunch or gate crashers to get in the way of your wedding. Weddings at Le Petit Château are very slick. They have organised so many in such a short space of time that they run like clockwork. It's very opulent and decadent and very different from most other wedding venues in Northumberland. Like any wedding venue in Northumberland it is a bit of a drive to get there and the roads can get quite treacherous in the winter. The style is very full on, and given that it was only built in 2016, it's pretty obvious that everything is 'constructed.' Given that you aren't in the heart of France it's clearly not authentic. It reminded me of Las Vegas in that it's so over the top you can't help but walk around marvelling at the absurdity of it all with a big, dumb smile on your face. To see more amazing Northumberland wedding venues, and real weddings and couples shoots, visit my Northumberland weddings page.